Comm Eye Health Vol. 15 No. 43 2002 pp 43-44. Published online 01 October 2002. Modern health care, eye care especially, is very much dependent on the use of technical equipment and instruments. These are expensive, more so in developing countries. Much of the quality equipment and instruments are made in developed countries and, even with normal and careful use, are subject to wear and tear. It is important to take good care of them and employ preventive maintenance to keep them working at all times. The ‘down time’, if any, during which an instrument or equipment is not working should be reduced to a minimum. We seek to answer the following questions by sharing our experience at Aravind Eye Care System in Madurai, India. Which methods will achieve these standards? Who can carry out these tasks? Understanding the correct use of the instrument. Instruments manufactured by well-established manufacturers and marketed by equally established suppliers are generally well made and strong. They seldom fail when used properly and with care. When instruments fail there is always some reason for the failure. Knowing how or why a failure has occurred is an important maintenance task. Without knowing the cause of a failure it will not be easy to fix it. Reading and understanding the user manual that comes with the instrument is essential for this task. Understanding the limitations of the instrument. Every instrument, by its design and construction, has some limits to its operations. Some can handle only a certain load at a time. Some can work only within a certain speed. Some have certain limits relating to environmental conditions (temperature, humidity etc.) for proper functioning. Some have certain limits of mobility when in use. It is important that these limits are well understood and remembered when the instrument is used. Instruments should, as far as possible, be used only within the prescribed limits of operation. Using an instrument to its maximum limit should be more an exception than a rule. Carrying out preventive maintenance. In health care it is well understood that prevention is better than cure. This also applies to both instruments and equipment. Periodic preventive maintenance is needed for trouble free performance. This includes protecting them from dust and stain, and checking and lubricating all moving parts to ensure smooth movement. It is vitally important to ensure that there is no ‘kink’ (bend) or obstruction in the tubes and valves of equipment that use some flow of fluid. The various other preventive maintenance tasks, specific to each piece of equipment, are explained in the user manual which should be read and the instructions carried out. Replacement of spares. Almost all items of equipment have certain parts that have a finite life. The bulb in instruments may be fused out (‘blow’). The electric fuse may be blown off. The belt, springs or wheels used to drive some part of the equipment may snap off or become loose or may be displaced or may be exhausted. An adequate stock of all spares is always required. Identifying faults and defects and knowing how to restore good function is important. Care of electrical parts. Almost all equipment uses electricity for operation. Simple electrical faults external to the equipment, like a damaged plug or switch, a short circuit or discontinuity in the connecting wire are not uncommon. Locating those defects and rectifying them is another maintenance task. Care of optical parts. Many pieces of equipment used in eye care have lenses, mirrors, prisms, reflectors, etc., which have surfaces of high optical quality and some of the surfaces may also have special coating for specific needs. Protecting those surfaces from dust and stains and removing dust and stain without causing any scratch or any damage to the coating is an important part of preventive maintenance. Aligning optics. Even slight displacements of the positions of optical components affect the quality of the images seen when using them. Care of surgical instruments. Taking care of the surgical instruments, sharpening the edges when necessary and repairing them when damaged are essential. Who can carry out these tasks? A qualified bio-medical engineer can probably do all these. However, such persons are not readily available, especially in developing countries. The tasks require a wide range of skills but the technology required is not very complex or difficult. Our experience is that an assistant in an eye hospital (perhaps an electrician, an ophthalmic nursing assistant or a refractionist), who has some interest in working with his/her hands, can be trained to do all the above tasks and even more. At Aravind we recruit polytechnic graduates. They have two or three years of engineering education and training beyond high school. With some extra on-the-job training in our instruments maintenance laboratories they are able to carry out all the tasks described above and also teach others. We have found from our experience that women will often do a better job then men! Technicians at Aravind also make spare parts for some instruments and are also encouraged to build simple equipment used in eye care. 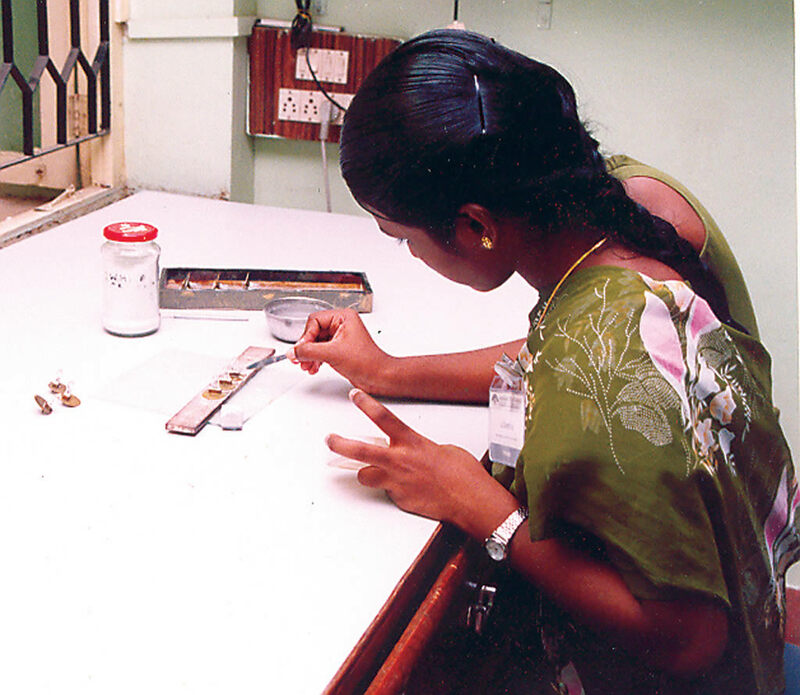 The six-week maintenance courses run in LAICO (Lions Aravind Institute of Community Ophthalmology), Aravind Eye Care System, Madurai, India aims to teach the skills needed for equipment and instruments maintenance. The courses have been organised since 1996. As of this date, we have conducted 27 such courses, training 151 technicians, including 20 women. Thirty-seven technicians (almost 25%), including 2 women, are from 14 developing countries outside India – Jamaica, Ghana, Nigeria, Uganda, Kenya, Malawi, Zambia, Zanzibar, Pakistan, Philippines, Nepal, Papua New Guinea, Indonesia, and Bangladesh. Towards the end of each training course the trainees, accompanied by some of the instructors, spend a few days in a hospital outside the Aravind Eye Care System and run a free maintenance camp. Such camps benefit the trainees who come across different types of equipment and instruments with different problems. The host hospital benefits because their needs in maintenance are taken care of by the trainees. One important feature of the Madurai courses is that the trainees are supplied with a set of hand tools so that they can start their work immediately, on reaching their hospitals after the training. We have received good reports of the work of several of the technicians trained at Madurai. Following the basic six-week course, we offer a trainer’s course. Persons taking up this training will be able to organise similar training courses in their own work places. The West African Health Community has taken advantage of this and three technicians from that region underwent the trainer’s course. With these technicians and two more technicians trained in earlier years as additional hands, a training centre was established in Nigeria. Two persons from Aravind were invited to Nigeria to take part in their first training course run in September-October 2000. Subsequently, the West African team has run two more courses. One of the technicians from Nigeria has established a maintenance facility in his home town, servicing ophthalmic and other medical instruments and employing others. A technician from Pakistan, trained in Madurai, is running a technician training course in his country. The April 2002 issue of Scan Optics News (Volume 5, Issue 1) records names of technicians from Africa who attended a service course run by Scan Optics for the maintenance of surgical microscopes. Of most interest to us at Aravind Eye Care System is that while most of the persons mentioned were trained at Madurai, the rest were trained in one of the three training courses in West Africa, run by Aravind trained trainers.